I am so excited! 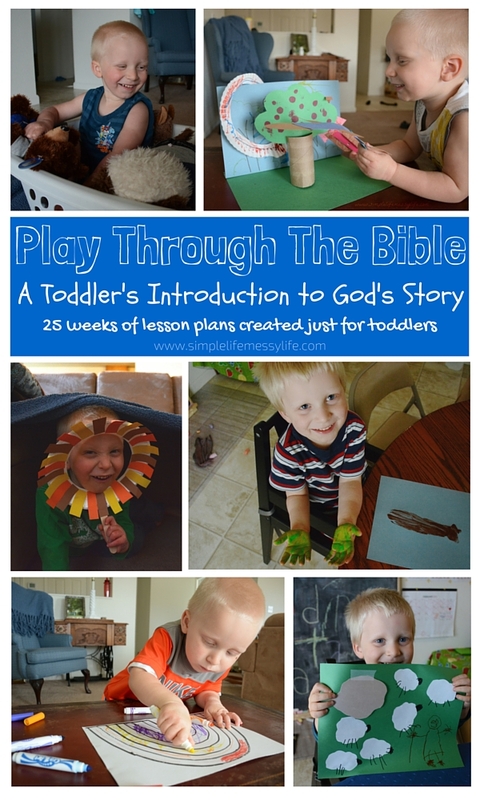 It’s finally time to begin our toddler bible study series. 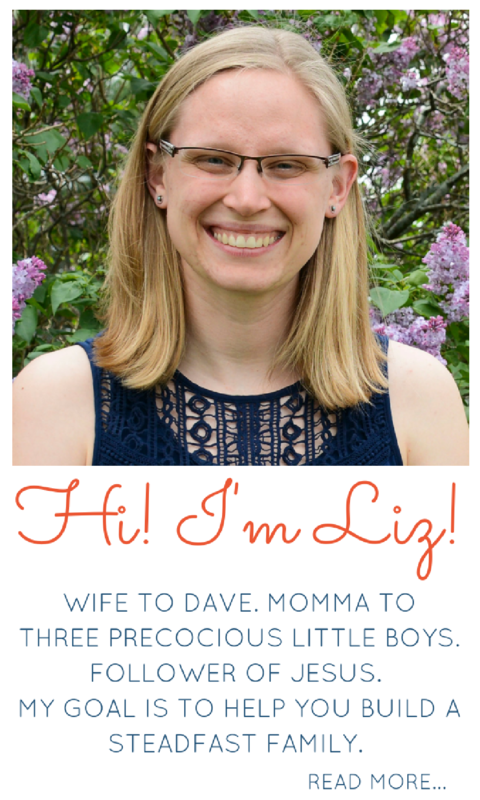 It’s going to be called “Play Through The Bible: A Toddler’s Introduction To God’s Story” and I wanted to take today to give you a little introduction before we jump in later this week. First, I want to explain a little of my focus with this curriculum. 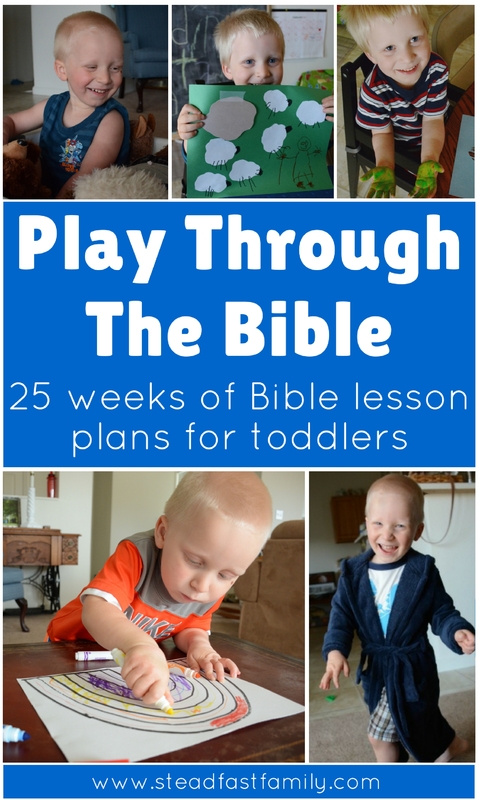 I first got the idea to write this curriculum because I wanted something that would allow me to introduce my toddler son to the Bible at his level in a simple, basic, and engaging way. I searched for what I was picturing in my mind, but couldn’t find quite what I was looking for. So, we started forging our own path. 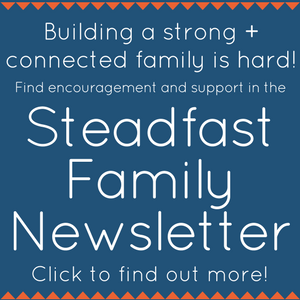 I wanted to share what we’ve been doing so that you, too, can begin to lay the foundation of God’s word in your child’s heart and mind. When I started doing activities with my toddler son, I learned early on that it was best to keep things simple. There was no telling how long his attention span would last and I didn’t want to take longer to prepare the activity than he took to actually do it. Plus, sometimes as adults we forget that what may seem simple to us can be exciting and new for a little one. There will be plenty of time for elaborate activities as my son gets older, but for now I’m keeping it simple. Because of this, I am writing this curriculum with simplicity in mind. You can easily prep the crafts in 5-10 minutes beforehand and none of the activities call for crazy supplies. I wanted this to be something so simple and easy that no matter how crazy things were that day, if you could spare 15 minutes you would be able to have Bible time that day. Our little toddlers and preschoolers are very concrete thinkers. If I tried to explain all the complex implications of the various Bible stories to my son, I would probably be met with a blank stare and he wouldn’t be very interested because it wouldn’t make sense to him. For that reason, I’ve chosen to keep the focus of this curriculum very basic. While a toddler may not be able to grasp all the theological ramifications of the fall of mankind, he can remember the names Adam and Eve and the very basic points of the story. Once this basic foundation is laid, it can be then built upon – adding more information and depth in each year to come. In this way, my son both grows up with God’s stories as a part of his life and he grows into them as he continues to mature in his understanding of God’s Word. Simply put, I want this curriculum to be perfectly in tune with the way toddlers learn best. Through stories, songs, hands-on crafts, and simple activities. In one word: play. Mr. Rogers sums it up wonderfully: “Play is often talked about as if it were a relief from serious learning. But for children play is serious learning. Play is really the work of childhood.” Doing the activities in this curriculum means that your child will be engaged, playing and having fun – not even realizing that God’s Word is being hidden away in his or her heart. The next thing I wanted to go over is our choice for a children’s Bible. 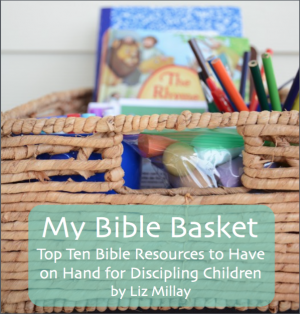 For the purpose of this study we are using one main children’s Bible and one supplementary children’s Bible. 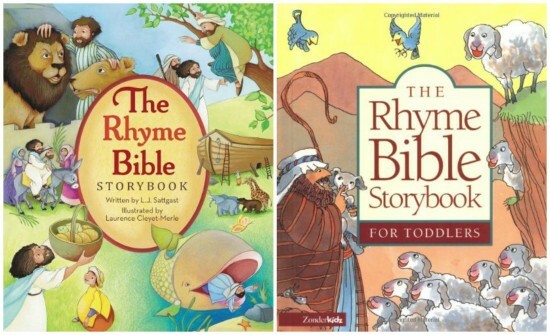 The main Bible we are using is The Rhyme Bible Storybook for Toddlers and the supplementary bible we are using is The Rhyme Bible Storybook . 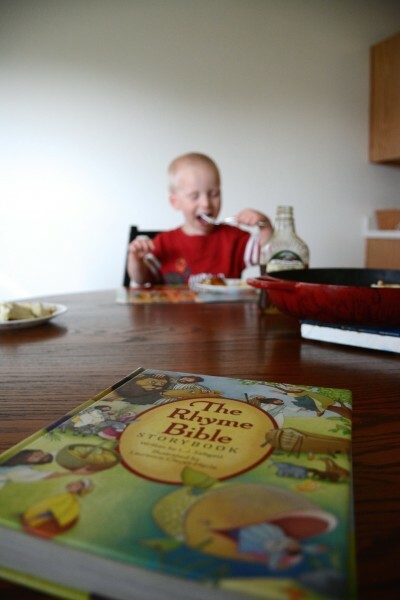 We started with using the original Rhyme Bible Storybook, but found that although we enjoyed reading the stories in it, some of them were a little above toddler level when we tried to really dig into them. Because of this, we switched to the toddler version. This will be the main Bible we are going to use, although we may add here and there from the original version or read both stories when applicable. For example, the second week is the story of Adam and Eve, however, this story is not found in the toddler version of this Bible. So, we will read it out of the original version instead. Now, if you are following along with us, you can definitely use whatever children’s Bible is your family’s favorite. I can’t guarantee the activities will match up perfectly, but I don’t think it would be that big of a problem. However, both of the Rhyme Bibles can be bought very cheaply on Amazon and I highly recommend checking them out! My plan is to release the upcoming week’s plans on Thursdays so that you will have plenty of time to look them over, prepare, and make any changes that you want (UPDATE: all the lessons can be now found here). The basic set up is that you will read one story every day for a week (we normally read at breakfast time). I’ve found that this method works great with toddlers because they usually love repetition. I’ve also found that aspects of the story my son didn’t quite grasp the first time we read the story, he is really starting to get by the end of the week. Then, there will be an activity you can do (the same activity for each day that week) and a different craft for each day. There are a couple other things included, totaling six different sections, so let’s go over those really quick so you’ll know how they work! This is the bottom line. The point to repeat over and over. This is what you want them to remember. For example, week one’s focus point is “God Created Everything.” So, that week, you really want to drive home God as creator and all the activities will support that. 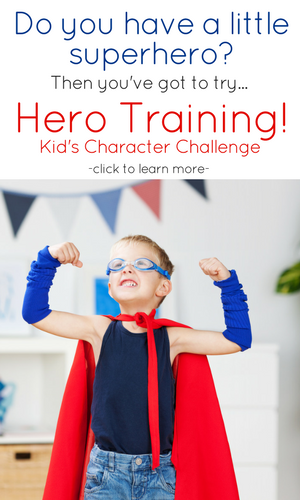 In this section, I’ll give a couple tips to make the story time fun and engaging. Whether it’s ideas to make the reading more dramatic or things to look out for that might be difficult for your toddler to grasp, if it’s something that helped us, I’ll pass it on to you. The activities in this section are fun and simple. The usually require either no supplies or things you have around your house already. They use play and kinesthetic learning to further reinforce the concepts and vocabulary learned in the week’s story. This is a unique section that came about due to a discovery I made while talking with my son. I realized that he likes to have the same conversations over and over and over again. He asks me the same questions and likes it when we talk about familiar topics. I decided to use this to my advantage and started having short conversations about the story we were working on, always keeping them about the same every time. They almost have a catechism-like feel to them. I’ve found that doing this really helps him remember the main points of the story. I usually start the week incorporating only part of the discussion I hope to have, slowly building up to the whole thing by the end of the week. He is always so proud of himself when he answers my questions! Like i’ve mentioned before, these crafts are very simple. You can usually prep them in just a few minutes. They are also simple in the way that they are very do-able for little toddler hands. Sure, they will need a little help here or there, but for the most part, they should be able to do them with a lot of independence. 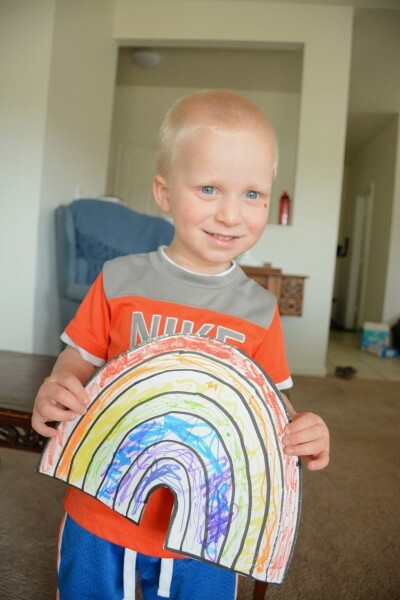 Almost every week, one of the crafts is a link to a downloadable coloring page. Doing the coloring page is great for those super busy days where you don’t have time for a full craft. We usually do them on Monday’s when I’m catching up from the weekend still. I’ve found it is a great introduction to the story, mainly focusing on just remembering the names of the characters. One more note about the crafts: they aren’t meant to be perfect works of art. Their purpose is more for the experience and the learning they provide. Plus, toddlers really don’t care about making their crafts perfect. For example, in the fourth week we make a tent for Abraham and Sarah. Does the tent end up looking super pretty? No way. However, my son thought it was awesome and the 30 minutes of playtime afterwards where he used some of his toys to play pretend with Abraham and Sarah was way better then the most awesome tent could have been. The last section is for miscellaneous resources. I’ll add whatever extra things we’ve found to add to that week’s story. Often it will be songs or other books that go along with the story that week. I’d also love to hear what extra ideas and resources you have discovered – if you leave them in the comments I’ll add them to the list! 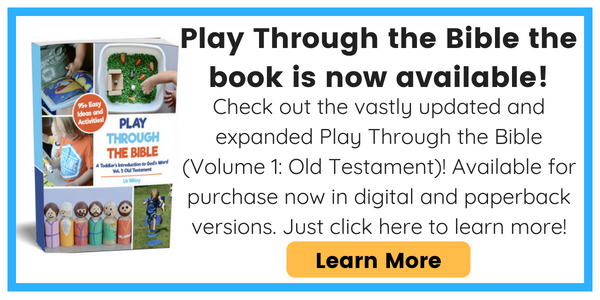 Another thing you can do is use the hashtag #playthroughthebible on Instagram or Twitter to share how you are using the Play Through The Bible curriculum. You can also connect with me on Facebook. I can’t wait to see how you make this study your own! Well, that’s about it! Look out for the first week of plans coming this Thursday (again, grab all the lessons here). If you don’t want to miss any, be sure to enter your e-mail address below to get weekly updates! I’m so glad I stumbled upon this series on my Pinterest page. I’m starting Tot school with my 2 1/2 year old next week and wanted some sort of bible lesson to go along with it. Thank you for putting this all together. I love the lessons and how the crafts are simple, yet effective. I can’t wait to start this! Thank you so so much for this incredible resource. it has been such an answer to prayer. I have begun to run the creche at church only about 3-4 children a week, would it be ok to use some of your ideas? Hi! So excited to start this curriculum with my little guy. I went to buy the Bibles on Amazon and see that there’s a hardcover book option and a board book option….and they appear to be different. Which ones do you have? Also, do they do any quoting of actual scripture? If they do, what translation do they use? Thanks so much for putting all of this together! This children’s Bible does not quote actual scripture in it. If you are looking for something that does, I highly recommend Tomie De’Paola’s Book of Bible Stories. I’ve been using with my son who is now 5 and it is a good introduction to word for word scripture. I’ve really enjoyed using your lessons with my littles at church. I am now trying to find something equally as good to use with 5th and 6th graders. Do you have any ideas or recommendatations? That’s awesome! Unfortunately I do not have any experience with curriculum for 5th and 6th graders, so I’m no help there. Sorry! God bless you and thank you very much for these beautiful materials. 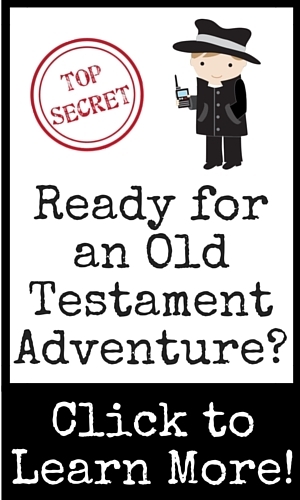 I am currently preparing for a toddlers curriculum for the church that is bible based. Great work!!! So happy to stumble this on pinterest.